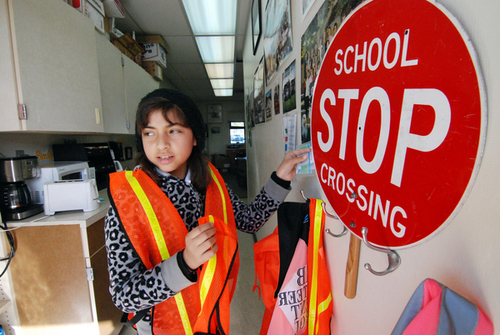 It’s 12:30 on a Wednesday afternoon and Alejandra Hinojosa and Rosario Serrano pull on bright orange vests and head onto the playground of Virginia Rocca Barton Elementary School in Salinas for their weekly shift as peer mediators. The two 6th graders, both 11, stroll the blacktop, clipboard in hand, as kids play foursquare and throw footballs. Near the soccer field, they encounter three girls in heated discussion. Alejandra and Rosario approach and ask if they want help. They agree, so Alejandra outlines a few rules. “No interrupting,” she says. “No name-calling. And repeat back what you hear from the other person.” One of the girls sighs loudly. The mediators glance at their clipboard and pose a series of questions: “What is this about? What bothered you? How did you feel about it?” Alicia and Cristina say the third girl, Billie (not their real names), was bugging them in class, teasing and making faces. The mediators lead the girls through a discussion and a resolution is reached. The girls agree to be nice to each other in class and avoid each other at recess. Alejandra and Rosario say they’ll check back in a few days to see how things are going. Peer mediator Esmeralda Macias stops by the team’s ready station to pick up her conflict resolution materials at Virginia Rocca Barton Elementary School in Salinas. These young peacemakers are among 25 Virginia Rocca Barton students trained as peer mediators in a program led by Restorative Justice Partners (RJP), a nonprofit working to promote new forms of dispute resolution and shift the culture of schools to promote empathy and respectful dialogue among students and staff. “We’re building those relationships so as harms come up, we have healthy ways to deal with it,” says Natalie Alfaro Frazier, coordinator of RJP’s Restorative Justice in the Schools program. The effort also aims to reduce the number of school suspensions and expulsions. Earlier this year, the U.S. Department of Education released data showing that African-American students are suspended and expelled at a rate three times greater than white students and that exclusion rates for Latino, Native-American and mixed-race students are at least 50 percent higher than for whites. Being kicked out also increases the chances of students avoiding school, dropping out and becoming involved with the juvenile justice system, the report’s author noted in a blog. Restorative justice aims to turn conflicts into opportunities for dialogue. “With restorative justice, we’re asking: What happened, who was wronged and how do we make it as right as possible?” says Alfaro Frazier. “With restorative justice, you get an opportunity to solve problems in different ways instead of using your hands,” says Pascual Morales, case manager for RJP’s program in the schools. Morales, who helps train the peer mediators, was raised on Salinas’ east side. 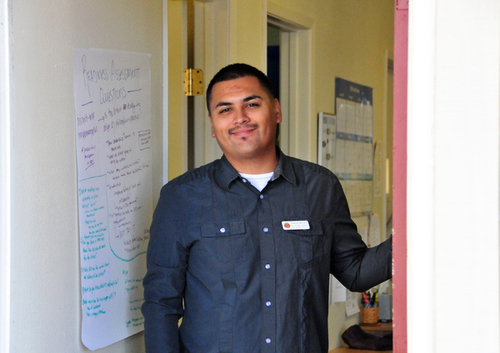 Case Manager Pascual Morales of Restorative Justice Partners, Inc. at their offices in Marina, CA. District, administrators asked for schools willing to take part. Virginia Rocca Barton’s principal, Jose Juan Urquizo, was immediately interested. He’d seen the power of the process the year before when vandals attacked two classrooms, spray-painting computers and walls with profanities. Police identified two culprits, including a 6th-grader from another school in the district. Following the incident, a restorative justice process was organized and the 6th-grader was asked to listen as students and staff members described how his actions affected them. A second meeting explored how the wrongs might be righted. The boy said nothing at the first meeting, Urquizo says, but spoke a bit at the second and later wrote a letter of apology that was read aloud to the classes affected. He wasn’t expelled and had no issues the rest of the year. Virginia Rocca Barton Elementary School Principal Jose Juan Urquizo high-fives student Michelle Becerra, who is turning in good behavior points at the front desk. “Kids loved that topic because they were able to tell teachers what they felt,” Urquizo says. Back on the playground, 11-year-old Juan Luna steps out of a game of foursquare to describe a mediation he recently led at a volleyball game. Two girls were telling a third girl to stop playing because she was bad. As Juan led them through a discussion, the girl cried and said she had the right to play since she was trying her best. The two girls apologized and they all shook hands, Juan said. 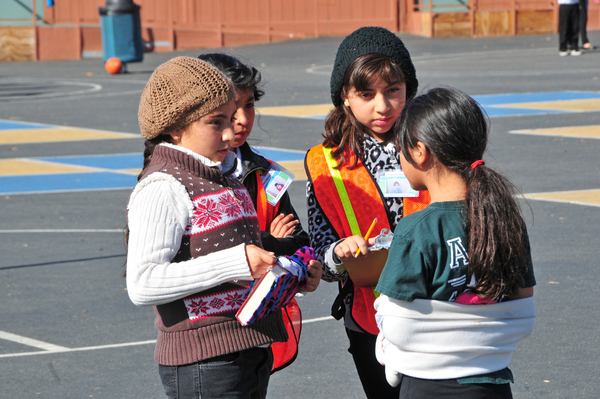 From left, Magdalena Macias, and peer mediators Samantha Gonzales and Esmeralda Macias, in orange, listen to both sides carefully in a lunchtime discussion at Virginia Rocca Barton Elementary School in Salinas. For more information about Restorative Justice Partners, visit www.restorativejusticepartners.com.